By now, it’s no surprise that Christmas is around the corner. The stores have been readying us for the “jolliest time of the year” since the kiddos went back to school. Fall ushered in Halloween, with Christmas fast behind it. But what about Thanksgiving? What has Thanksgiving become? More and more, Thanksgiving is becoming an overlooked holiday, squeezed in between the commercialism of Halloween and Christmas. Thanksgiving is coming…but the Christmas takeover is here. 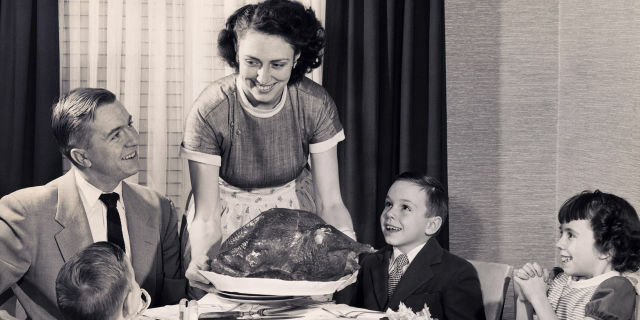 Thanksgiving traditions have been deeply rooted in our American psyche. Turkey, heavy carbs, pumpkin pie, and the afternoon spent lazily dozing on the couch while football plays on the TV is the often favored ritual. The last few years, however, has found the Thanksgiving meal being rushed (if not forgotten all together) in order to spend the afternoon in line at retail stores, sharpening elbows in an attempt at getting the best price on the hottest toy or electronic gadget. So what should Thanksgiving be about? Traditionally, it’s supposed to be a day when people gather together to be thankful for each other and the blessings in their lives. In a world of hustle and bustle, it’s easy to lose touch with those you care about and the things that matter most. Whether it’s with a big family full of cousins who you only see once a year or with a small group of friends who have become family to you, it’s a time of the year to celebrate the people and the blessings in your life. So this Thanksgiving enjoy the day with family and friends reflecting on all the wonderful things in your life. Slow down, pause, and reflect on the fact that no matter how hard the year has been, it’s the small things in life to be appreciative of. This time of reflection is usually done after consuming large amounts of turkey – Then again, maybe it’s just the tryptophan kicking in! From our family to yours we wish you a wonderful and delicious turkey day – Happy Thanksgiving!